Release the base of a 20cm springform pan and invert. Line the base with baking paper and secure in the pan, allowing the edges to overhang. Grease the side of the pan and line with baking paper, extending the paper about 1.5cm above the rim. Use a sharp serrated knife to slice the cake horizontally so the bottom layer is about 1.5cm thick. Place in the base of the prepared pan. Slice the cake again to get another 1.5cm-thick layer. Cut pieces from this layer to fill in any gaps in the pan, so the base is completely covered. Use a large spoon to scoop flat pieces of the dark chocolate ice-cream over the cake. Allow to slightly soften, then spread it in an even layer. Place in the freezer for 1 hour or until firm. Repeat to make a layer of chocolate ice-cream then coffee ice-cream. Scoop the vanilla ice-cream into a large bowl and drizzle with the Baileys. Use a large metal spoon to combine quickly, making sure the ice-cream doesn’t melt. Spread over the coffee ice-cream and place in the freezer for 6 hours or overnight to chill. Place a platter in the freezer to chill. Remove the cake from the pan and remove the baking paper. Place the cake on the chilled platter. Top with whipped cream and dust with cocoa powder. 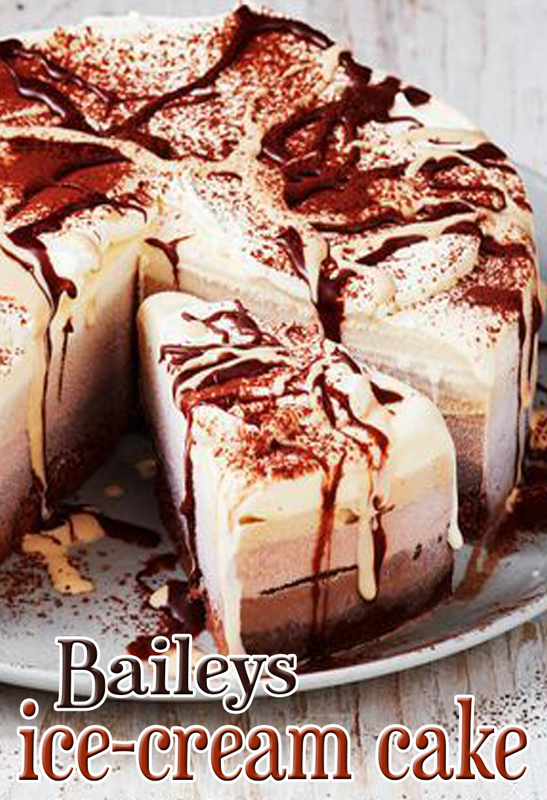 Drizzle with chocolate sauce and serve with extra Baileys. Serve immediately or return to the freezer until required – the cream on top can be eaten frozen.